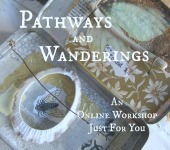 -my journey as an artist, workshop designer and teacher. 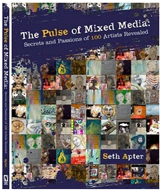 A few days ago I returned from an amazing retreat that I taught with Seth Apter from The Altered Page. I'm still basking in the glow of Taos and the Mabel Dodge Luhan House where our retreat was held. From the first moment we arrived there was magic. We all noticed it, Seth and I, our students, and even the staff. They said that we brought an alchemy to the house. We were enchanted. I loved teaching with Seth. We broke up our teaching days by one of us teaching in the morning, and one in the afternoon. This worked beautifully. We had both created brand new projects just for this workshop, and all of them would fit into our "cases of curiosities." My heart is full of images of the beautiful creations our students made with us. Each unique, each magical just like they were. We took many field trips! Our favorite's were to to see Annie Coe who is one of my featured artists in Storytelling with Collage. And to visit Leighanna Light's and Thomas Ashman's studio! It was so exciting for all of us to meet these amazing artists in person! A special thanks to Bonnie for working with us to make this workshop happen, and to all the staff at Mabel's for taking such beautiful care of us! We can't wait until next year! I am also very excited share that I have a post featured on the Cloth Paper Scissors Website, where I share more thoughts about this workshop, My New Book and my Live Webinar on March 31st!!! 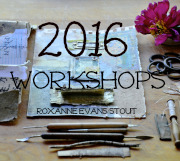 Roxanne- This looks like an amazing workshop in such a wonderful environment. We went to Taos a number of years ago now and it is so magical. So glad to see your beautiful images,and I have no doubt the workshop was wonderful. I made a cabinet of curiosities last summer in which the community of Haines Junction was invited to participate. We filled the cabinet with wonderful treasures. I would have loved to have been able to join in your amazing workshop. I like your emphasis on magic. I am very attracted to activities where everyone involved wants to lose themselves in a process that they hope will change them, or at least enrich them. Roxanne, So wonderful to meet you too! Lovely photos. Can't wait for you to come back, it was fun spending time, though it was too short. Such wonderful memories coming alive again through your photos. Thanks for sharing this experience with me Roxanne. Sign up for my newsletter! Send me an email. Find my new stencils at Stencil Girl!! So proud to be published in these books! Nature Journaling at River Garden Studio, an on-line workshop! Welcome to River Garden Studio!